By combining Macbeth with elements of traditional Japanese drama, Akira Kurosawa produced a singular, transcultural film experience. 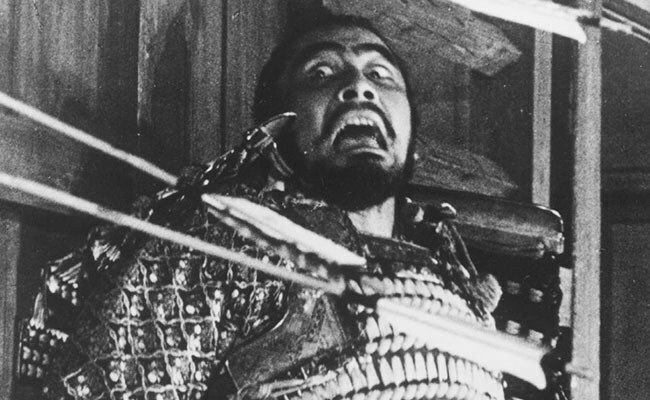 Few images from the hundreds of disparate film adaptations of William Shakespeare’s works are as iconic as those from the climactic final scene in Akira Kurosawa’s lush, haunting reimagining of Macbeth, Throne of Blood, in which the mad Lord Washizu (played savagely by the great Toshiro Mifune) succumbs to a flurry of arrows fired at him by his own soldiers. In a fit of delusional desperation, Washizu swipes arrows off the walls of his castle and plucks them from his armor in vain as more come raining down upon him; driven insane by greed, paranoia and bloodlust, he screams and flails in anguish as the shots pierce his body. It’s a seminal scene, particularly because it contains some of the most cinematic shots in one of the least stagey Shakespeare film adaptations ever made. Such statements are difficult to corroborate, but Throne of Blood makes its own case by being refreshingly unlike so many stuffy, dry European versions of Macbeth on film. There's more than enough evidence to make the argument: the camerawork is flowing and grandiose (shot by frequent Kurosawa collaborator Asakazu Nakai), the sets are designed with an eerie emptiness -- filled out with layers of fog and stark shadows that play wonderfully in black-and-white -- and the action is filmed with an intensity that rivals that of any Hollywood murder mystery, gangster film, or swashbuckling adventure. Three years before Throne of Blood, Kurosawa released his epic action masterpiece Seven Samurai, and though Throne of Blood proved to be a far darker and more brooding take on the extreme violence of feudal Japan, Seven Samurai helped establish the director’s keen eye for thrilling action that he would expand upon later in his career, put to particularly great use in this brutal and violent film. Kurosawa imported his own signature brands of action, fantasy, and suspense into the Western canon first through the international success of Seven Samurai and then through Throne of Blood’s unique take on Shakespeare, thus proving to be one of the few film directors in the history of the medium truly capable of owning the writer’s work with a singular vision. Part of that vision manifests itself in the Japanese essence with which the director imbues the story. Much has been made of the influence of the traditional Japanese art of Noh theater on Throne of Blood and Kurosawa as a whole, but the way he combines those two cultural paradigms -- Japanese theater and Shakespearean tragedy -- to make a universally compelling work of art is nothing short of masterful. Perhaps more stunning than Washizu’s death scene is the mesmerizing portrayal of Kurosawa’s Lady Macbeth analogue Lady Asaji -- played by a chilling Isuzu Yamada -- who, inspired by Noh theater, moves like a ghost and rarely emotes with her face. One of the more visually stunning sequences in the film finds Washizu confronting an evil spirit in the labyrinthine, fog-filled Spider’s Web Forest in a stick hut, where the ghostly white image spins a wheel and provokes Washizu with a prophecy -- a scene pulled directly from a Noh drama. Kurosawa keenly saw parallels in two disparate cultural traditions and combined them in Throne of Blood, speaking to the widespread admiration with which he’s remembered both in Japan and abroad. Kurosawa’s fingerprints on Western film are evident enough through the movies he directly inspired, from beloved westerns like The Magnificent Seven and Sergio Leone’s Man With No Name Trilogy (based on Kurosawa’s Seven Samurai and Yojimbo/Sanjuro, respectively) to massive cultural touchstones like Star Wars (loosely inspired by The Hidden Fortress and much of the rest of Kurosawa’s oeuvre). Throne of Blood showed that Kurosawa was just as driven and inspired by Western culture as Western culture would soon be driven by him, proof of a symbiotic artistic relationship that has ultimately made the international community of film more beautiful, bold, and adventurous. Over the course of his legendary career, Kurosawa only adapted the Bard one other time, in the epic, arguably-superior (by virtue of being one of the greatest films of all time) King Lear rework Ran, but Throne of Blood captures the bloody, murky insanity of Shakespearean tragedy better than almost any other film ever made. It’s the work of an artist who understood the power hidden within every element of filmmaking, proof of the idea that one can make a creative and highly stylized work of art that is also universally approachable and entertaining. This helps explain why today Kurosawa is still regarded as one of the most accessible directors in all of world cinema, and why his films are still cherished around the globe even when he instills in them a uniquely Japanese sensibility as he did with Throne of Blood. The film, like many of the director’s great classics, is truly a transcultural masterwork. The remaining special features add up to a relatively sparse offering: a trailer for the film, a dry but informative commentary by Japanese film scholar Michael Jeck, and a 23-minute documentary from a series titled Akira Kurosawa: It is Wonderful to Create that focuses on the production design of Throne of Blood and the particular elements of Noh drama that Kurosawa utilized in the film. Of course, Criterion have released so many Kurosawa classics over the years that the well of usable special features is no doubt running dry, but what sampling is offered here is of characteristically top-notch quality in its insight into the film and the director’s processes.